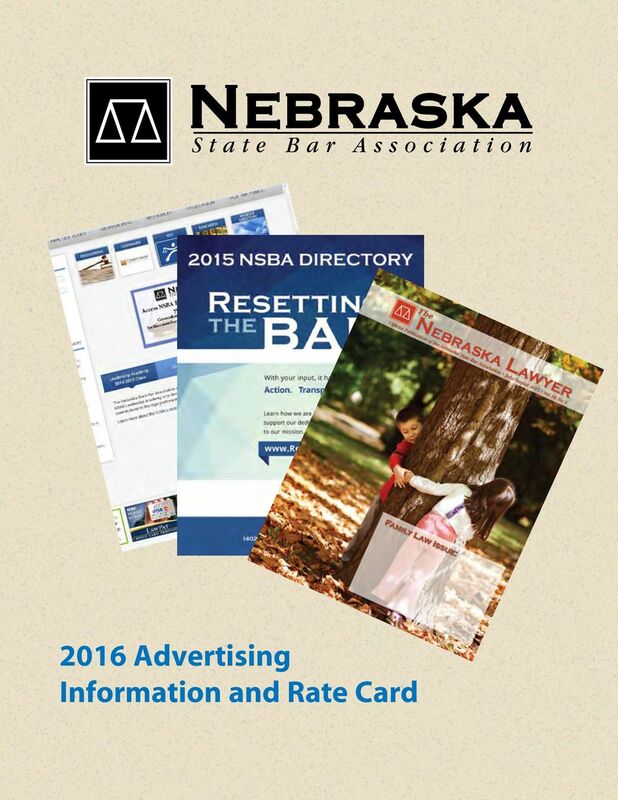 Download "2016 Advertising Information and Rate Card"
3 Trying to reach one of Nebraska s most desirable markets? Here s Your Chance!! 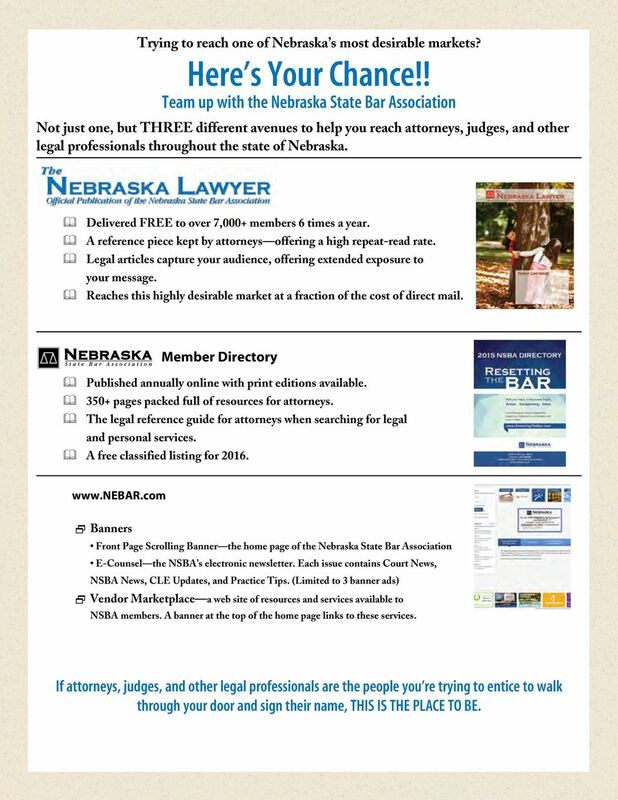 Team up with the Nebraska State Bar Association Not just one, but THREE different avenues to help you reach attorneys, judges, and other legal professionals throughout the state of Nebraska. & Delivered FREE to over 7,000+ members 6 times a year. & A reference piece kept by attorneys offering a high repeat-read rate. & Legal articles capture your audience, offering extended exposure to your message. & Reaches this highly desirable market at a fraction of the cost of direct mail. Member Directory & Published annually online with print editions available. & 350+ pages packed full of resources for attorneys. & The legal reference guide for attorneys when searching for legal and personal services. 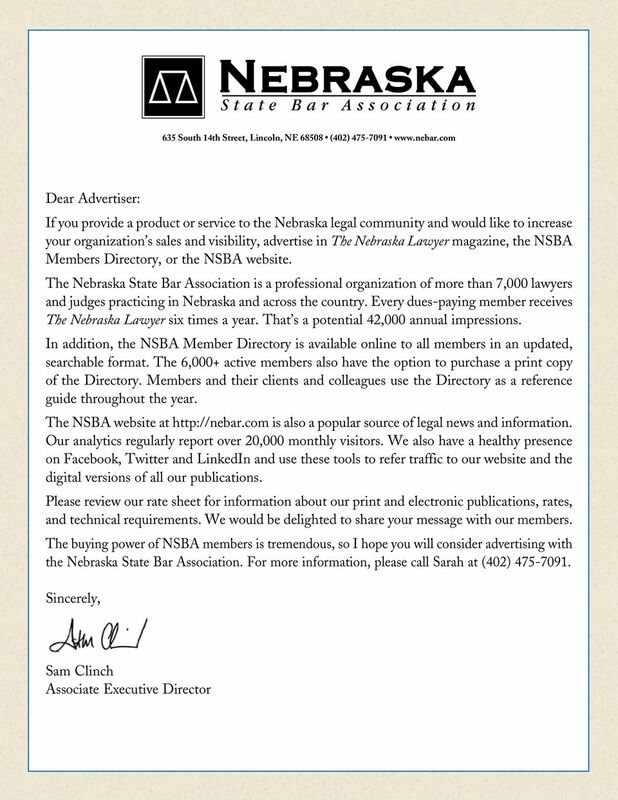 & A free classified listing for Banners Front Page Scrolling Banner the home page of the Nebraska State Bar Association E-Counsel the NSBA s electronic newsletter. Each issue contains Court News, NSBA News, CLE Updates, and Practice Tips. 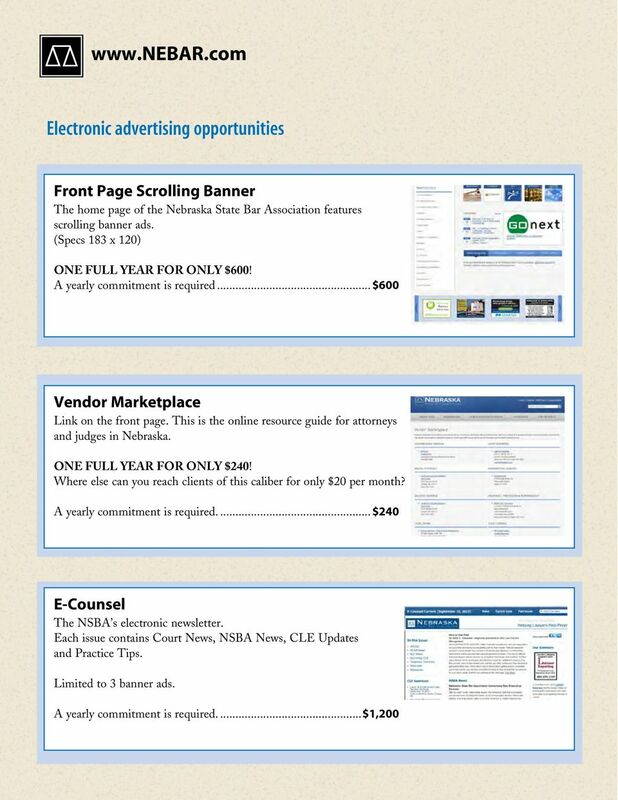 (Limited to 3 banner ads) 2 Vendor Marketplace a web site of resources and services available to NSBA members. A banner at the top of the home page links to these services. If attorneys, judges, and other legal professionals are the people you re trying to entice to walk through your door and sign their name, THIS IS THE PLACE TO BE. 4 Ad Rates Due Dates Specs AD SIZE DIMENSIONS 1X 4X 6X Full Page 7.5 x $800 $750 $700 2/3 Page Vertical x 8.5 $650 $620 $590 2/3 Page Horizontal 7.5 x 6 $650 $620 $590 Half Page 7.5 x 4.5 $550 $525 $500 1/3 Page Vertical x 8.5 $450 $430 $410 1/3 Page Horizontal 7.5 x 3 $450 $430 $410 1/4 Page 4.5 x $400 $375 $365 1/6 Page Vertical $350 $335 $320 1/6 Page Horizontal x 2.25 $350 $335 $320 Business Card 3.5 x 2 $185 $170 $160 Inside Front Cover (full page) 8.5 x $1,050 $1,000 $950 Inside Back (full page) 8.5 x $1,150 $1,100 $1,050 Outside Back Cover (full page) 8.5 x $950 $900 $850 ISSUE AD ART DUE January/February 2016 December 4, 2015 March/April 2016 February 5, 2016 May/June 2016 April 8, 2016 July/August 2016 June 3, 2016 September /October 2016 August 5, 2016 November/December 2016 October 7, 2016 Publication The Nebraska Lawyer is the official publication of the Nebraska State Bar Association. A high quality bi-monthly publication, The Nebraska Lawyer is published for the purpose of educating and informing lawyers about current issues and concerns relating to their practice of law. Readership includes 7,000+ attorneys, judges, law office personnel and administrators. It is published 6 times a year. 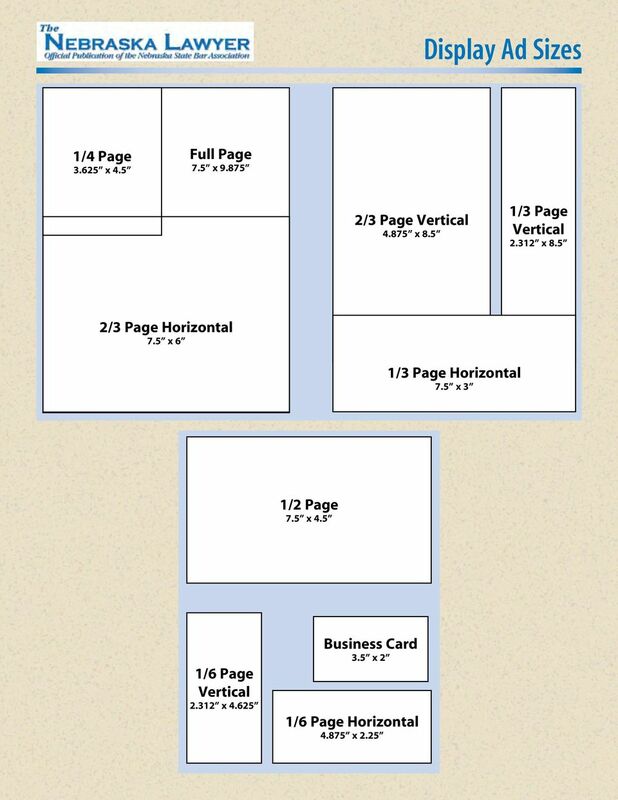 Print Specifications Trim size 8.5 x Sheet-fed offset lithography printing from electronically-produced artwork. Saddle-stitch binding. Inside pages are black ink only; outside and inside front and back covers are 4-color process. 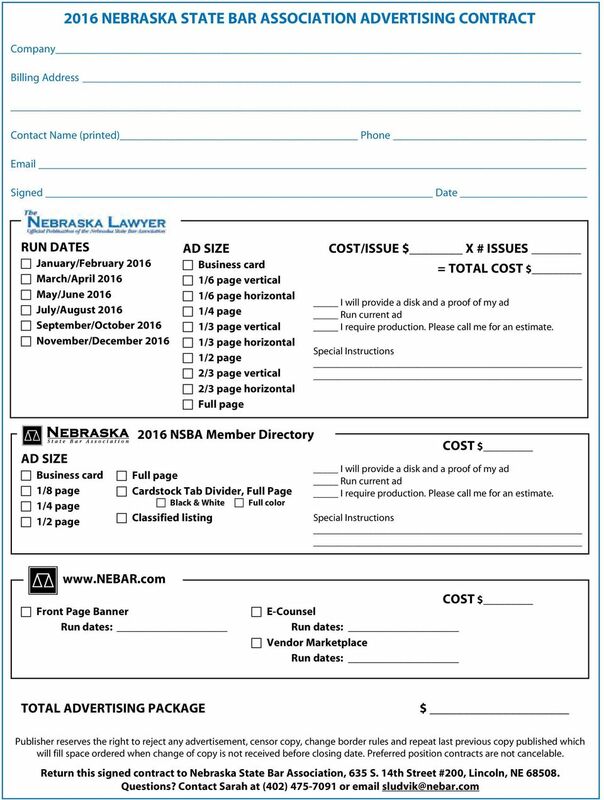 Submitted Ad Specifications The Nebraska Lawyer is produced using Adobe Creative Suite 5 (Indesign and Photoshop) and Adobe Acrobat 9 Pro. Ads submitted for use in the magazine must be sent in the following formats and/or programs: Adobe Indesign CS5 or lower, JPEG, EPS, TIF or PDF. All files must be in high resolution at 300dpi. Advertisements submitted in PowerPoint, Microsoft Publisher and Microsoft Excel or other programs are not acceptable. The Nebraska Lawyer is not responsible for ads submitted with missing graphics or fonts, or improperly embedded fonts. If you need to reach Utah s legal community, the Utah State Bar can help you communicate with it s members in a number of ways. Staying in front of FSAE Members - decision makers & meeting planners = more business for you. nutrition bodywork spirituality holistic medicine sustainable living personal growth education Reach today s conscious consumers BellaSpark Magazine has been serving the holistic community since 1993. 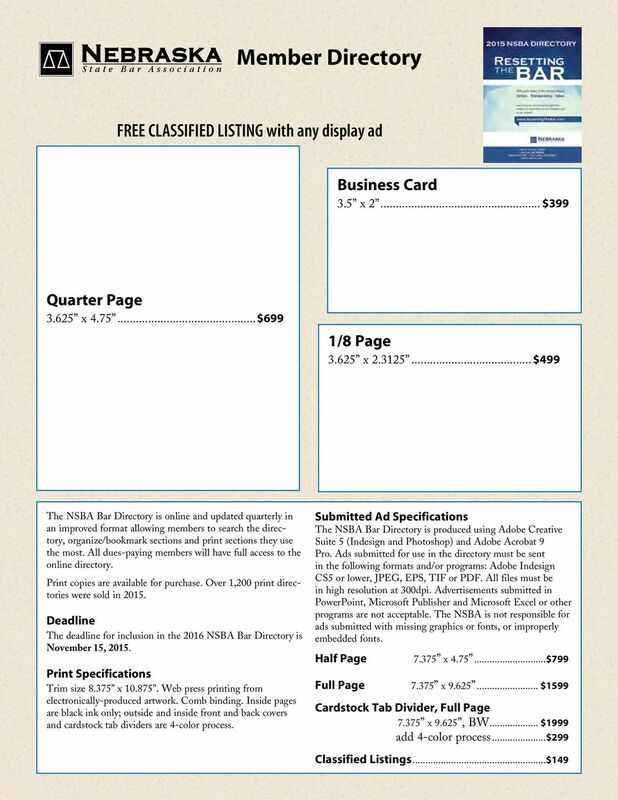 ADVERTISING RATE CARD 2015 FULL PAGE (COLOR AD MAY BLEED) 1/2 PAGE ISLAND 1/8 PAGE 1/2 PAGE HORIZONTAL 1/4 PAGE Page Size: 8.5 x 11 is final trim size. Ad Size Width Height Full page bleed 8.75" 11.25"
All Advertising subject to NASN approval. REACH THOUSANDS IN THE HR INDUSTRY! ONLINE VERSION REACHES MORE THAN NORTHERN CALIFORNIA. Who will you reach by advertising with CSHP? Call for Leaders in Innovation! MEDIA KIT Association for Leaders in Print, Mail, Fulfillment and Marketing Services Build brand recognition in North America's more than $80 billion commercial printing and graphic communications industry. Media Kit 2016. Media solutions to reach Canada s high net worth accounting professionals quickly and effectively. Media Kit 2016. Media solutions to reach Canada s high net worth legal professionals quickly and effectively. Media Kit 2015. Media solutions to reach Canada s high net worth legal professionals quickly and effectively. 2015 2016 ADVERTISING RATE CARD Reach the professionals who are reaching kids. The empowers school psychologists by advancing effective practices to improve students learning, behavior, and mental health. 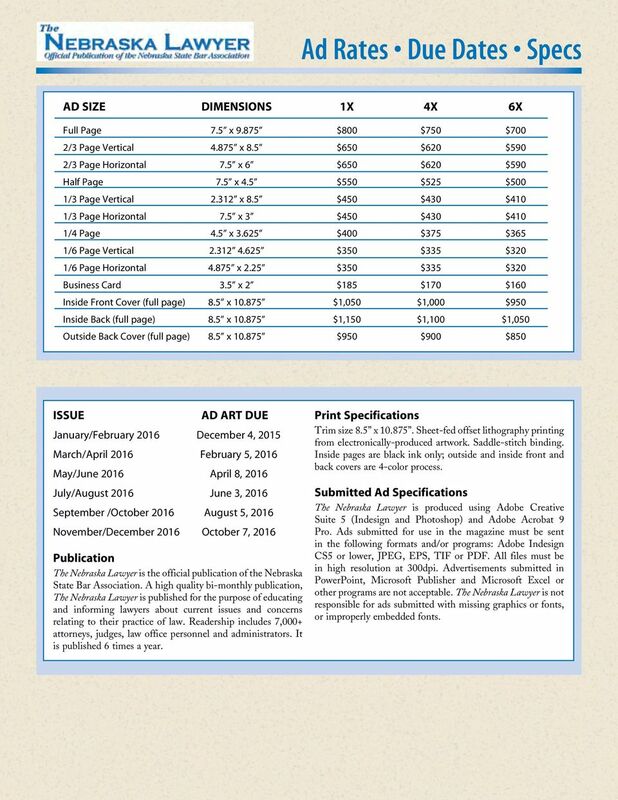 Please review the attached pages, including the AWC Advertising Rate Sheet. A comprehensive guide to English study in the United States. Tap into the biggest and fastest growing amusement industry today. 2016 MEDIA KIT Connect With a Community of More than 63,000 Adult Swimmers More than 65 percent of U.S. Masters Swimming members report they re more likely to buy a brand that s advertised in SWIMMER magazine. Providing training, education and compliance programs for the mobile air conditioning and heat transfer industry. Click here to view ACtion magazine Founded in 1981, MACS is the leading non-profit trade association for the mobile air conditioning, heating and engine cooling system segment of the automotive aftermarket. The Produce Industry s Resource for Real-Time Business Information For more than 100 years, produce industry businesses have trusted Blue Book Services as their go-to source for real-time business data. Make an investment for immediate ROI and long - term success. Media Kit 2015. Media solutions to reach Ontario s high net worth legal professionals quickly and effectively. As an advertiser, you want results. 205 Media Kit By advertising in The Colorado Lawyer and The Docket, you can reach a targeted and affluent audience in editorially superior magazines with confirmed readerships.